Halloween is the time when people dress up and go door to door to collect different types of candy from various houses. Every Halloween season there are a lot of haunted houses, mazes, and trails that people can explore. 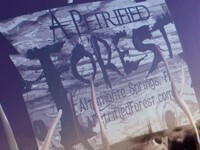 One specific haunted trail that people attend is Petrified Forest. The Petrified Forest has two different haunted trails that change every Halloween season. The theme this year was ‘The Hunted’ and ‘The Family Swamp’. ‘The Hunted’ is an interactive trail that is based off the aftermath of the 2031 contamination, while ‘The Family Swamp’ is about a family whose swamp has been contaminated for years. The Petrified Forest contains many actors and actresses that help with the scare part of the trail. However, there are other employees that help run the trial. Some Lake Brantley high school students work or volunteer at Petrified Forest each year. The Petrified Forest actors and actresses do not intentionally mean to touch you while you walk on the trail. However, on the ‘Total Eclipse’ nights, actors and actresses are allowed to touch you. For these nights you do have to sign a waiver and those under the age of 18 must be accompanied by an adult.